Stock up on these Hidden Valley 1.5 oz. creamy caesar dressing packets for your salad bar, restaurant, or catered event! Flavorful and slightly tangy with just the right amount of spices, it's thick and creamy enough to cling to romaine lettuce in salads or be spread atop chicken caesar wraps. The velvety-smooth texture of this dressing is also great for sandwiches and entrees. Featuring a cool white color, this dressing can be added to a variety of dishes as a quick and easy way to enhance profitable menu items! This product enhances your salads with the quality taste your customers have come to love and expect from the Hidden Valley name brand. This premium dressing comes in 1.5 oz. 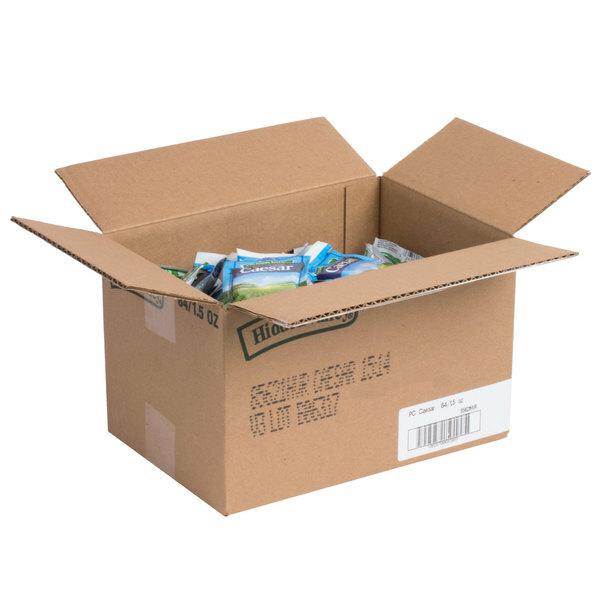 packets, which reduce waste from unused product in bulk containers and help save food costs. This convenient size is perfect for customers to grab at self-serve cafeterias or for staff to pack in restaurant takeout bags. It delivers just the right amount of fresh flavor to satisfy your customers and allow for quick and easy service! The smooth creamy flavor of caesar dressing is a favorite of many salad fans. Hidden Valley is the first name in salad dressings. And, this little portion sized packet is perfect for in house or take out orders. The light, creamy taste of caesar dressing is a crowd pleaser and Hidden Valley makes one of the best. These little portion control packets are perfect for cafeteria, diner, or take-out orders. You can't go wrong with Hidden Valley. Rich and creamy, the fresh flavors of this dressing are a compliment to any salad. The handy portion-control packet makes this product cost-effective and the Hidden Valley brand screams quality. I highly recommend this product. The taste of caesar dressing is perhaps one of the most popular flavors in salads, and Hidden Valley's creamy offering is among the very best. This economical serving packet offers the best for in-store or on-the-go. I highly recommend this product. A nice style creamy Caesar dressing packet that is perfect for our meals. The perfect dressing for dipping food or topping a fresh garden salad. 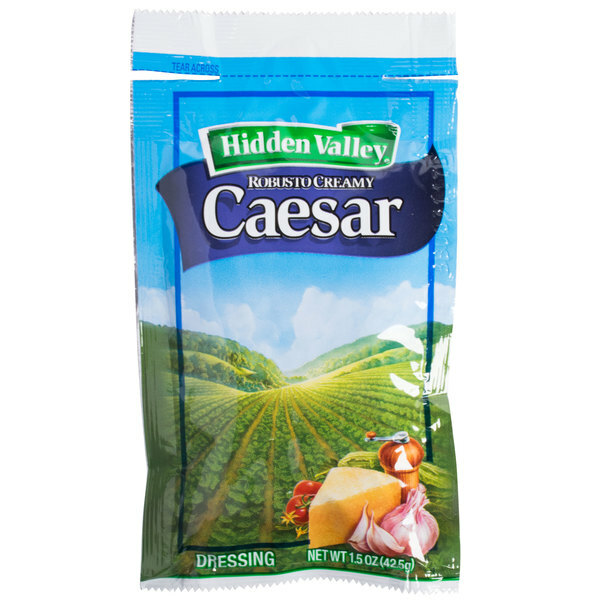 Hidden Valley Creamy Caesar is very rich, creamy and incredibly delicious. The price is a steal on Webstaurant. This is great for to go chef and Caesar salads. A fabulous creamy dressing bursting with a great flavor. It is great for our to go Caesar salads and allow the customers to apply their own dressing resulting in a fresh,crisp salad. The portion packs a high quality and are easy to open. The Hidden Valley packets were a great deal for the price, quantity and product. These packets have a long shelf life and arrived in excellent condition. We will most definitely order again. Great for bringing to work lunch. The dressing is good and tastes the same as the bottled version. Only this one is more convenient. Very zesty and creamy.